Posted on 14 July 2013. Long-haired Chihuahuas have become just as popular as the smooth coat variety, and they are bought and bred as both show dogs and companion dogs. The long-haired Chihuahua is thought to be a “newer” kind of Chi, bred from the original smooth coat Chi and crossed with either Papillons or Pomeranians. 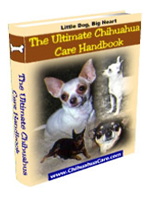 The long-haired Chihuahua shares the same major characteristics as the smooth-coated Chi. They are both tiny dogs, with a maximum height of six to nine inches. Their weight is between two and six pounds. The breed has many colour and marking variations, from solid tan, white or black, with many combinations of different colour sections and spots. All colour variations are permissible for dog show entries and for breeding. By British and American breeding standards, the weight is the only restriction, with six pounds being the maximum weight for conformity. there is however, no restriction on height. This makes the Chihuahua a breed of dog with a high percentage of variation in height. Some Chihuahuas can be as tall as 15 inches. 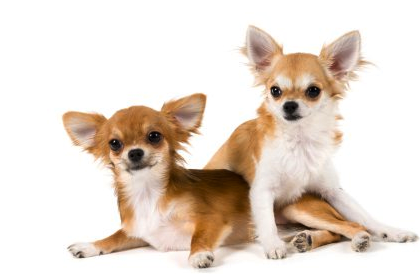 Long-haired Chihuahuas and short-coat Chihuahuas are exactly the same genetically. The major physical variation between Chihuahuas is whether they have apple-shaped heads, or deer-shaped heads. The “deer” headed Chis have slightly elongated facial features, while the “apple” headed Chis have much flatter, compact features. The long-haired Chis can have different textured coats. Some have fine, smooth hair, while other have have that is more bristled. Although the short-coated Chihuahuas are also referred to as “smooth-coats,” their coats are very often not as smooth as those of the long-coats. Chihuahuas have a “sickle tail,” which curves towards their backs, but does not hang over their backs. It is always held erect. Long-haired Chihuahuas make wonderful pets. they are fiercely loyal to their owners and are good watch dogs. You absolutely cannot ignore their high-pitched bark when they detect an unknown person lurking at your doors or windows. Due to their small size, they are perfect for people living in apartments. They do not need a lot of exercise to stay healthy, which means that letting them roam around your house or apartment is sufficient. 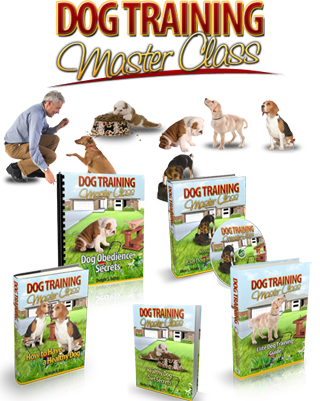 They live a long time, up to 16 years, so they are great as a companion dog for kids. They are a little difficult to housebreak, but respond to training well, once they are comfortable with their owners and living environment. Even though long-haired Chihuahuas need more brushing than the smooth-coated ones, the actual time spent grooming them is minimal. You should only have to brush their coats once a week. this depends, of course, on whether you Chi is housebound or not. The most basic, useful accessory you should buy is Chihuahua clothes. UK winters are extremely cold, and bear in mind that the generally accepted origins of this breed are in the warm climate of Mexico and southern United States. Even though your long-haired Chihuahua has a built-in coat, the breed is notorious for being unable to maintain a high enough body temperature. This is probably due to the small mass of the dog. 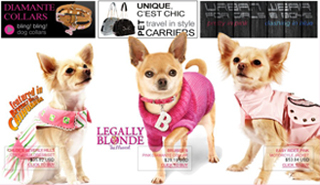 There is a wide variety of Chihuahua clothing available; UK shoppers can purchase these items at pet stores and from webstores. There is something available in clothing lines to fit everyone’s budget. Travelling with your Chihuahua is something you will probably do quite often. Consider buying a designer soft carry bag for your Chi. Take advantage of the low weight and small size of your Chihuahua, by not restricting yourself to buying the standard hard pet carrying cases. For journeys in a car, what could be better than a safety seat that is also a booster seat for your tiny Chi? Having something to look at while on a long trip, will make car trips more enjoyable for your naturally inquisitive Chihuahua. If you groom your long-haired Chihuahua carefully, you really should compliment their appearance with designer Chihuahua collars. If your Chi is a tough little male, give him a suitable macho collar. Your cute pampered female Chi deserves something charming and elegant in the collar range. Have a look around this site’s webstore and treat both you and your long-haired Chihuahua to something different and unique.